Lindsey Mitchell with Mercy Integrated Physical Therapy wraps an ice pack around Sonnin Dahl’s ankle. Dahl recently had the talus bone in her ankle replaced with an implant custom made by a 3D printer. The innovative procedure is expected to allow Dahl to resume skiing and hiking. Ankle bones that die from lack of blood supply can now be replaced with cobalt-chrome implants custom made for the patient based on CT scans. Sonnin Dahl endured more than a year of pain before she had an ankle bone replaced at Mercy Regional Medical Center, one of a few hospitals in the country offering the procedure. Dahl’s talus, the bone that allows the ankle to move up and down, had died from lack of blood supply after it broke, a condition called avascular necrosis, said Dr. Doug Lucas, an orthopedic surgeon with Mercy Orthopedic Associates. The condition is painful because the bones around the talus start to suffer and arthritis develops, he said. Dahl, 46, is not sure exactly how or when her talus broke because the injury was one of a long list of foot and ankle problems. 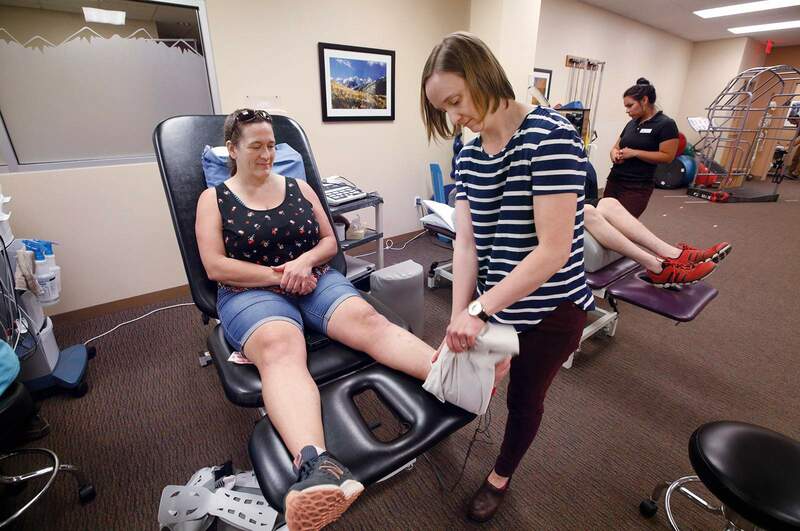 Dahl has struggled with her feet since she was in her 20s and needed four surgeries to correct her flat-foot deformity, a condition that resulted in both arches of her feet falling flat, she said. “You end up with broken bones and pulled tendons. Just everything is in the wrong place and over-stressed,” she said. 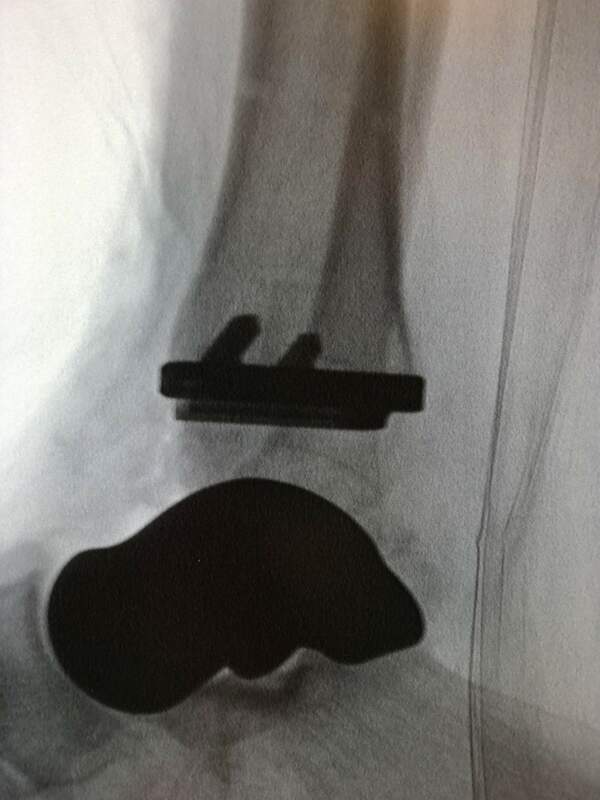 An X-ray image shows an implanted cobalt-chrome talus and a plastic piece on the end of the tibia that was put in as part of the surgery. She also had a surgery to stabilize her fractured talus before it died. People with a dead talus face limited options. Some have their talus fused to their heel and/or leg bone, which can limit their mobility. They can also have their foot amputated and use a prosthesis, Lucas said. Lucas suggested a third option to Dahl. She could go to Duke University Health System and see Dr. Selene Parekh, who replaces ankle bones with 3D-printed implants. But going to North Carolina for surgery would have been a challenge for Dahl for a variety of reasons, including, at minimum, a nine-day stay out of state. After researching the option, Dahl and another one of Lucas’ patients asked if the doctor could do the surgery at Mercy. Bayfield High School teacher Sonnin Dahl had a collapsed ankle bone replaced with a 3D-printed implant made by Additive Orthopaedics. Once he received approval from Centura Health, Lucas ended up doing both surgeries on the same day in June. Mercy is the third location in the country where the procedure has been completed, Lucas said. “Dr. Lucas just moved mountains to get authorization to do it here at Mercy,” Dahl said. Several weeks after her talus replacement, she said she felt it was the best post-surgical recovery she has experienced, without much swelling or bruising, and far less pain than she experienced before the surgery. “Yesterday was the best I’ve felt walking in more than two years,” she said Tuesday. The talus replacement was her sixth surgery on her left foot and ankle, she said. 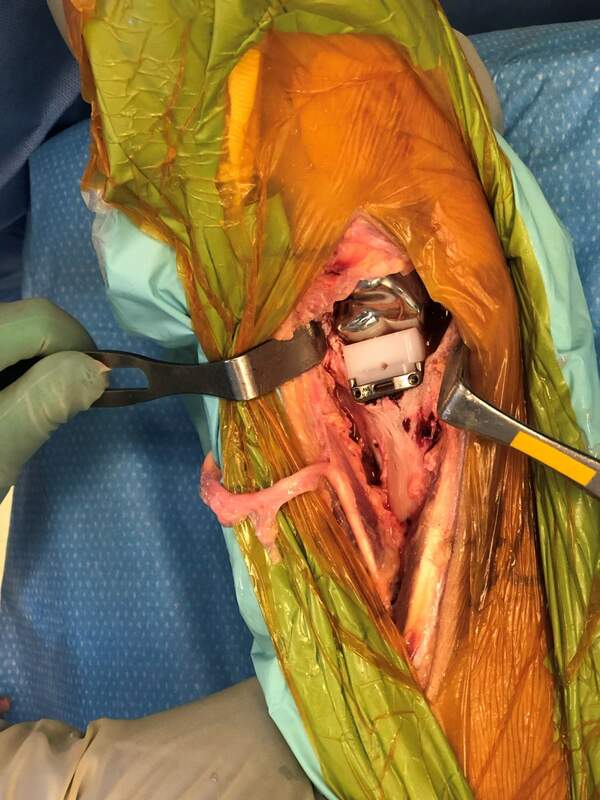 Her new cobalt-chrome talus was 3D-printed by Additive Orthopaedics based on CT scans of her other talus, which ensured a good fit, Lucas said. 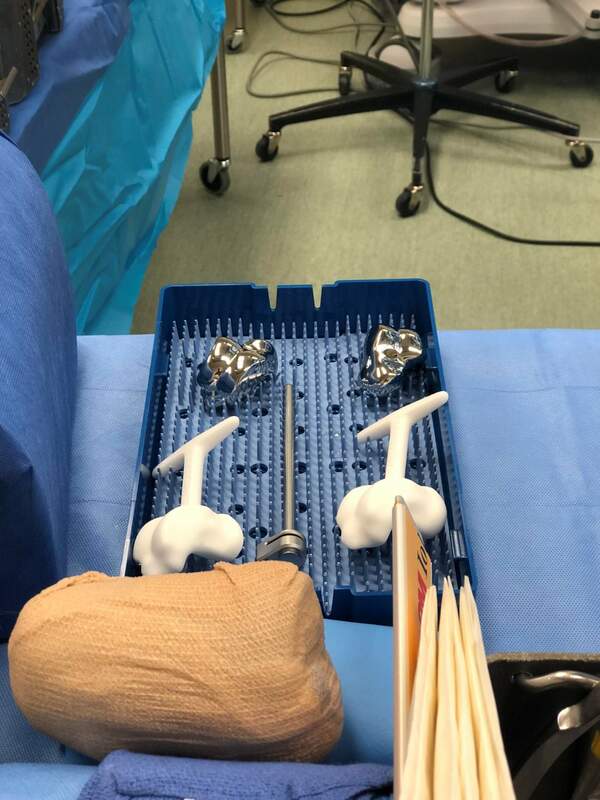 Before advances in imaging and 3D printing, a doctor in Baltimore had attempted to replace talus bones with metal implants, but it was difficult to get a good fit, he said. The month leading up to surgery was particularly painful for Dahl because her dead talus had collapsed and she spent much of her time with her foot elevated and on ice. “My ankle was about 2 inches shorter and 2 inches wider,” she said. Bayfield High School teacher Sonnin Dahl had an ankle bone replaced with a metal implant in June. Before she received her implant, her ankle bone collapsed and she had to have an external fixator to keep the joint stable. 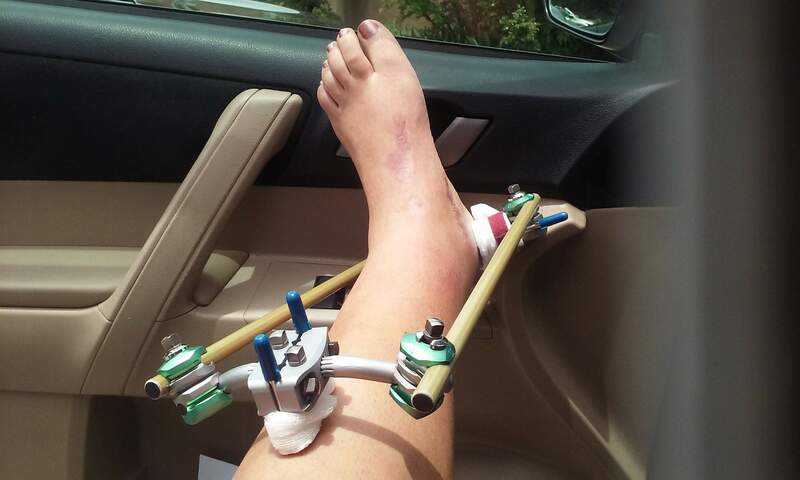 To stabilize the joint, she had to have an external fixator, which looked a bit like a metal cage, with the bar through the heel and pins going into the shin. Now that her talus has been replaced, she won’t be able to go back to running, but the Bayfield High School teacher expects to ski, camp and hike again with her three children after she heals, she said. “It will be nice to get that back,” she said. Now that Lucas is approved to provide the procedure, he expects there will be more demand for the surgery at Mercy. He encouraged people with a dead talus to consider it. “There are a lot of people that have been told you need an amputation and they don’t want to do it, and now, they are just living with it and it’s miserable,” he said. Lucas described the cost of the procedure as reasonable, considering that while amputation may be cheaper, patients may have to regularly replace a prosthesis. However, insurance companies may ask outside doctors to review the need for the procedure because it is relatively new, he said.